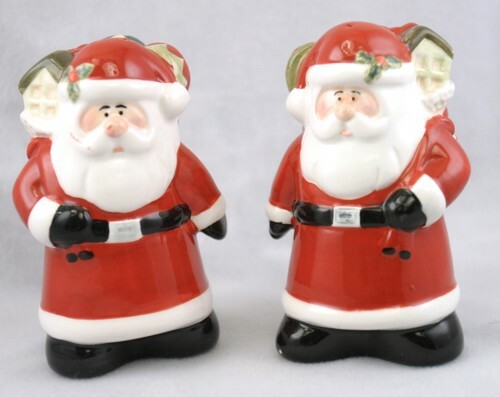 Santa Claus ceramic salt and pepper shakers. Santa wears a traditional white-trimmed red dress and hat. He is carrying a sack full of gifts. One has 2 holes, the other has 3. Microwave and dishwasher safe. Each is about 4 1/4 inches high by 2 1/2 inches by 2 1/2 inches. Excellent condition. One tiny chip on one of them.